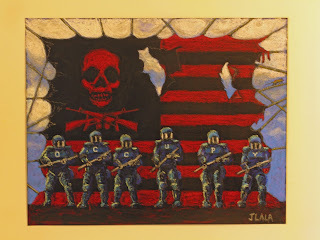 "The illusion of freedom in America will continue as long as it’s profitable to continue the illusion. At the point where the illusion becomes too expensive to maintain, they will just take down the scenery, they will pull back the curtains, they will move the tables and chairs out of the way and you will see the brick wall at the back of the theater." On December 17th members of Occupy Los Angeles gathered to protest the continuing imprisonment and torture of Bradley Manning, the Army soldier and whistle blower who is currently on trial for his actions. During the protest, Steven Releford was arrested by LAPD and reportedly beaten, jailed, and is currently being charged with a felony and held for an absurdly high bail. 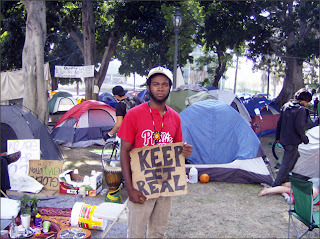 A short while ago I interviewed Mr. Releford at Occupy LA, so of course I'm worried about him. Ruth Fowler, the independent journalist who has been extensively covering Occupy LA and Occupy WS so much her work was been mentioned on several major media outlets, including the major news organization, RT, has an article here about Mr. Releford's arrest. I can't help but feel that there is a very real, very organized, very intentional silencing of the Occupy protests and 99% Movement that has been going on since they first started. The big media blackout, the corporate and militarized police force collusion that has operated to crack down on the protests, the beatings of journalists trying to cover the Occupy protests, etc., it's all going on because let's face it, everything Occupy represents scares the hell out of the corrupt people at the top that know the villagers are finally angry, and are storming the castle with pitchforks and torches blazing. I'm not trying to be dramatic or instigate violent revolution. The Occupy movement is working. Lawmakers and politicians, either because they are scared of losing their jobs or because they are emboldened by the political enlightenment that has been illuminating the people of America, are going after the corrupt forces at work that truly deserve the long arm of the law. All rhetoric, sturm and drang aside, here is my interview with Mr. Opamago Casciani, a Cornell law student and media representative for the Occupy movement. 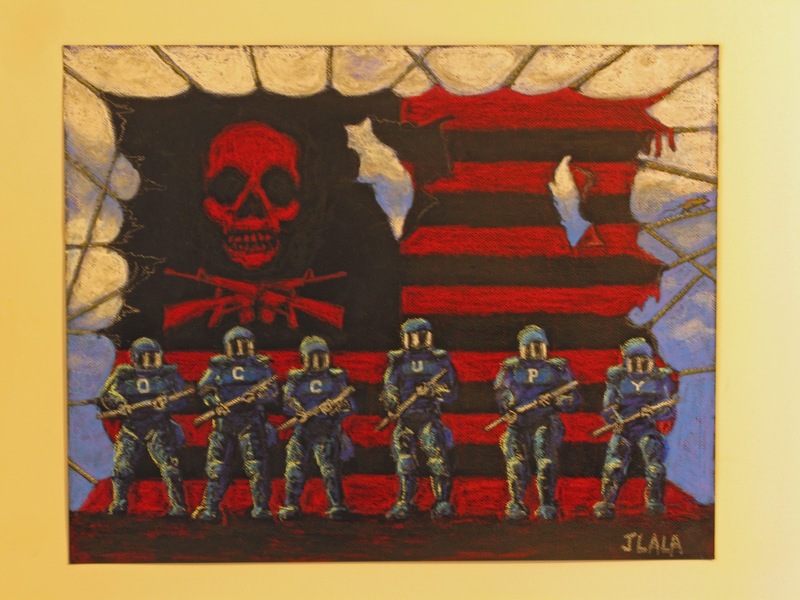 This interview was a few days before the crackdown on the Occupy L.A. camp. Thank you very much for taking the time to speak with me. What is your name? My name is Odamago Casciani. I’m a law student at Cornell. I’m from New York. I’m actually part of Anonymous. I’m helping to coordinate things, here. I’ve been at Occupy Wall Street and in Zucotti Park, before I came here. Is this a legal eviction? No. This is the city of LA enforcing laws they weren’t enforcing, before. Is there still a chance that Occupy L.A. can perform some sort of legal action to be allowed to stay here, or is that unnecessary because you already, legally have permission to be here? Well, they have no responsibility to give us our rights. It’s up to us. But there are legal actions we could take. First thing I would do? An injunction. First, to hold off everything. Just stop moving. We’re not moving, they’re not moving. Just stop. Once we have that injunction, we go before a judge. Then, a judge has to evict us, which a judge can do, or a judge can tell the city council to come up with a new resolution, which would redact the previous resolution. Since a city council resolution allows us to stay here, that’s the law. That means that you can’t just decide that the grass is dying so we have to leave. So the city claims that in order to maintain the park, the camp has to go? Yes. Their whole reason is that it’s unsanitary, first of all. That seems to always be the reason. Yeah, every single Occupy. They also claim that it’s because of public safety. Did anyone provide evidence for this, or was it something they just decided to do? I don’t know what’s being said during the meetings with the mayor behind closed doors, but I personally think it’s a political maneuver. The mayor believes, since LA has been peaceful, if he can find a way to get us to leave peacefully it will look great for him politically, without violence or chaose, it will look good on him politically. Why do the camps have to exist? Why should you stay here? Well, my thing is…I was actually in the strategy room when they came up with the idea for tents. The tents would stand for freedom of speech. I think it’s good symbolism. If money is considered freedom of speech, so are tents. Because if corporations can say that money is freedom of speech, then why in the hell can I not say that my tent is freedom of speech? So on that level, I believe that the tents and the Occupations themselves are signature to the movement, because without them we are just like every regular non-profit organization out there. Do you feel that previous demonstrations have not been effective? Do you mean, like previous demonstrations like the End the Fed March? Like that, but also during the entire Bush Adminstration, when there were huge protests against the war in Iraq the media would just show the crowd for about thirty seconds and nothing would happen. It felt like that no matter how big a protect could get, it could just get ignored. Exactly. I go back to Ghandi. They won because of publicity. They were so controversial, the things they were doing at the time, that the media had a story. A march, well, that’s people with signs, walking. But no one has ever seen tents outside City Hall. Now the media is all over it. We have caused people to look at us. That’s why I believe tents are the signature of the whole Occupation. To get people aware. To get them to look and ask, “What are they talking about?” And then once people are asking those questions, they can look for the answers or come over here and find out about it. 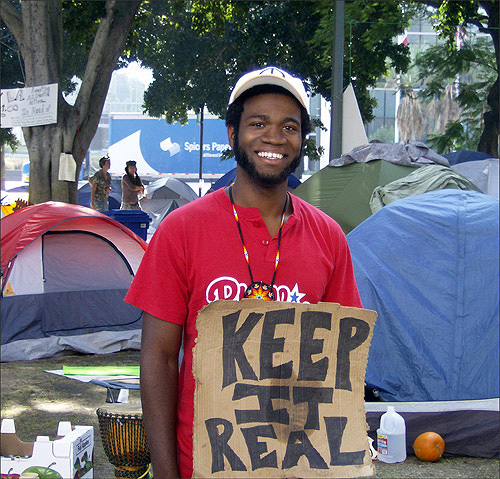 Do you think Occupy has had an impact on politics in America? I’m going to say this with a little salt, but I think that we could have had an impact if we were more organized. But I will say that we’ve had an impact because we’ve changed the perception of the public. Because, before Occupy, we knew what the issues were. You were either scared of them, so you didn’t go in to deep, or you just didn’t care. Because of the Occupy movement we have forced people to really look at the issues. The mainstream media is actually looking at the issues. Before Occupy, it was all about, “Bail outs, give the banks more money, why do the banks have so much money?” Now, they are talking about how the whole Federal Reserve is messed up. Henry Paulson…what was he doing? Timothy Geitner, what was he doing? Before all this, nobody cared if anyone was even prosecuted. Now, the majority of us are calling for them to be prosecuted. So on think that on that level, we have affected the public paradigm. Do you think that anything is actually going to happen tonight? What is next for Occupy? If this camp is shut down, how do we keep getting the message out? I believe that, yes, for the camp, they are going to come in and do what they need to do. Although it is illegal, we could sue them for this, and I’m a law student saying this, but it’s a good thing. It’s going to force us to organize. It’s going to force us to come back. That guy over there right now, speaking to the crowd, I don’t even know him. He’s just some guy who heard that they were going to shut us down, so he came out with a megaphone to give a speech. That just goes to show that being shut down is going to make us stronger. So the next time, are things going to be more surgical? Because as much as I hope that nothing bad happens tonight, it seems like when anything bad happens, you guys get noticed, more. Because it proves the whole point. Our rights as a people have continuously been downplayed. We can be in a public park. This is called a “public” park. You’re telling me I can’t be at a public park? People may not agree with the individual idealogies that are in the camp, but they’ll join us. Just the fact that they are doing what they are doing proves that we live in a police state. So if you can’t have camps anymore, what can you do to get the message out? I believe that we can bring the same strategy we have up in New York here to LA, I think that’s what’s going to be born out of them coming in and shutting this camp down. I believe that a lot of the people that aren’t here for the movement will fizzle out. We could shut down the Staples Center. I call it, “Causing constructive chaos. It’s chaos, for the city, but very constructive for the people. Sure, we shut down that Bank of America the other day, but it doesn’t matter, because everything is happening electronically. You haven’t shut it down, because they are still conducting business. But we could all enter a Bank of America, act like we were going to start an account, and then tell everyone working there real statistics about how they are screwing people, in front of all of the customers. Right now, everyone here is peaceful. But we’re all very angry. President Kennedy once said, “Those who make peaceful revolution impossible will make violent revolution inevitable." We’re not at that stage, yet, but they don’t know that when they keep trying to shut us down, it’s only bringing more of us out. You can contact Mayor Antonio Villaraigosa about Occupy L.A. right here.